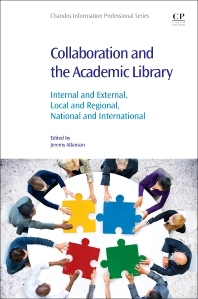 Collaboration and the Academic Library: Internal and External, Local and Regional, National and International explores the considerable change that has affected universities and academic libraries in recent years. Given this complex and important context, it is clear that the academic library increasingly needs to operate in partnership with its users and other professionals and organizations to be successful in meeting the needs of its clientele. Academic librarians need to work closely with client groups so that services are relevant, and close partnerships with other professionals need to be forged to provide seamless services for users. The book looks at all aspects of collaboration affecting academic libraries, both internally and externally, to help the reader understand future directions for collaborative activities in a complex and difficult working environment. Jeremy Atkinson has wide-ranging experience and expertise in the leadership, management and development of academic library services. He had overall responsibility for the strategic and operational management of library and information services at the University of Glamorgan from 1991 to 2012. He previously held library posts at the University of Northumbria, Cardiff University and Manchester Metropolitan University. He has had a long standing and active involvement in a large number of UK strategic committees and groups, notably those of Jisc (continuous involvement from 1998 – 2012), SCONUL (including three years as a trustee and member of SCONUL Executive Board) and WHELF (Wales Higher Education Libraries Forum). For WHELF he was Chair of the WHELF Development Group and responsible for the HELP (Higher Education Libraries in Partnership) project, which defined the future direction of Welsh academic library collaboration, and for the development of the WHEEL (Welsh Higher Education Electronic Library) initiative, covering e-journal and e-book procurement for the Welsh HE sector.